If you’re looking for a new family vehicle in the Mechanicstown area, come visit us here at Middletown Honda and drive the 2014 Honda Odyssey. The Odyssey has developed a reputation for being a reliable, well-made, well thought-out family hauler, and the 2014 version is just that, especially with new features like a built-in vacuum cleaner. We think the Honda Odyssey outmatches one of its key competitors, the 2014 Chrysler Town & Country is some key ways. Read on to see how they stack up! Fuel Economy: efficiency has become a primary concern for many car buyers. For lower emissions and lower gas bills people are choosing vehicles that get better gas mileage, and that makes a lot of sense! 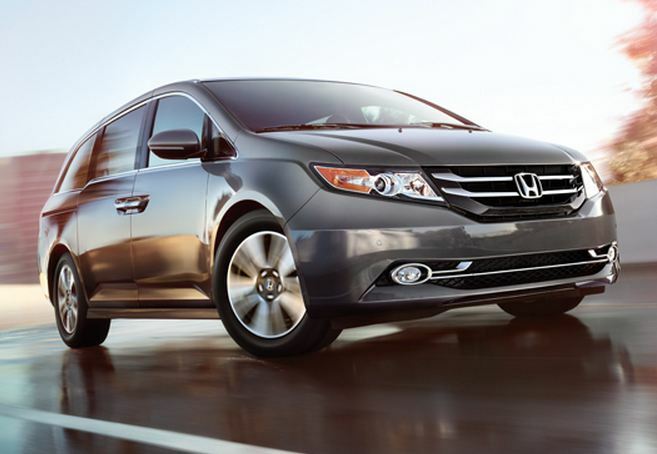 The 2014 Honda Odyssey simply beats the Chrysler hands down with an EPA rating of 28 mpg highway/19 mpg city/22 mpg combined, while the Chrysler sits at 25 mpg highway/17mpg city/20 mpg combined. Maneuverability: the Honda Odyssey has a smaller turning diameter—36.7 feet—compared to the 39.1 feet turning circle of the Chrysler. That means you’ll be able to maneuver more easily in tight spaces. Passenger Space: The Odyssey simply has more space for passengers than the Town & Country, and that’s no doubt one thing you prioritize in a minivan. The Odyssey has 172.6 cubic feet of passenger volume while the Chrysler only has 162.8 cubic feet. That’s a pretty big difference! Cargo Volume: the Odyssey will also carry more cargo than the Chrysler. It’s got a cargo volume with all the seats up of 38.4 cubic feet and a max cargo volume of 148.5 cubic feet. The Chrysler has 33 cubic feet with all the seats up and 143.8 cubic feet with the seats folded down. Convenience: the Odyssey and the Town & Country can both come equipped very well from navigation to heated leather seats to rear seat entertainment systems. One thing that you can’t have on the Town & Country, but you can have on the Odyssey is a vacuum cleaner. That’s right. The Odyssey is available with an onboard vacuum to help clean up those messes. At Middletown Honda, your leading Mechanicstown-area Honda dealer, we’re proud to carry the latest Honda Odyssey. We’re located just a few minutes north of Mechanicstown at 520 Route 211 E in Middletown, NY.